**Images shown are of the Standard Dorm Size Trunk. Other sizes look the same only larger. Please review dimensions below. 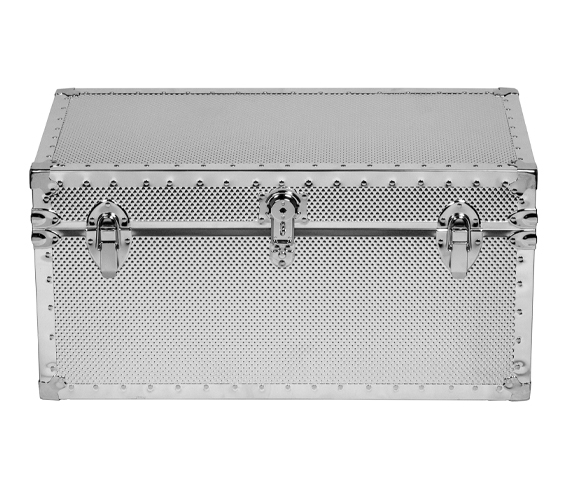 Protect all of your most important valuables in our durable and reinforced Embossed Steel Trunk. 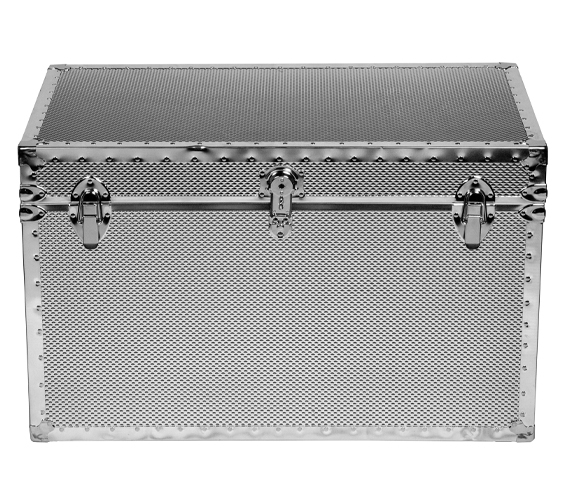 Made in the USA, this steel trunk is fire retardant and extra durable for storing important college necessities. This durable dorm footlocker easily transitions to store your home goods when you move out of your dorm room and into your first place after college graduation. Our dorm room steel storage trunk is perfect for both girls and guys who are looking for quality and long-lasting storage in their college dorm without aesthetic frills or cheap construction. Available in Standard Dorm Size, Oversized, or Oversized Plus, our college steel storage trunk is made to fit all your college organizational storage needs. Open the steel lid to reveal the large quality made ¼” OSB wood-vinyl lined storage compartment. The interior wood-vinyl softens the exterior's steel look while being stain proof and easily cleaned for your convenience. The latch on the front of this dorm footlocker is both sturdy and allows for the addition of a lock so your dorm essentials stored inside are always protected. 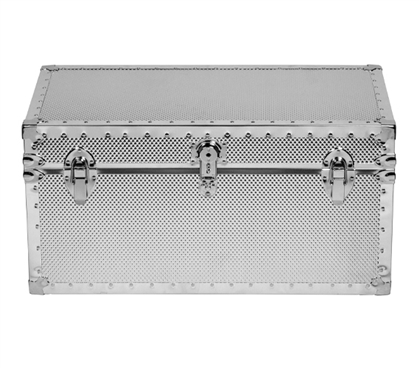 This embossed steel storage trunk can be used in your dorm for year-round storage or filled with all your college items on college breaks, keeping all your dorm stuff organized and centrally located. 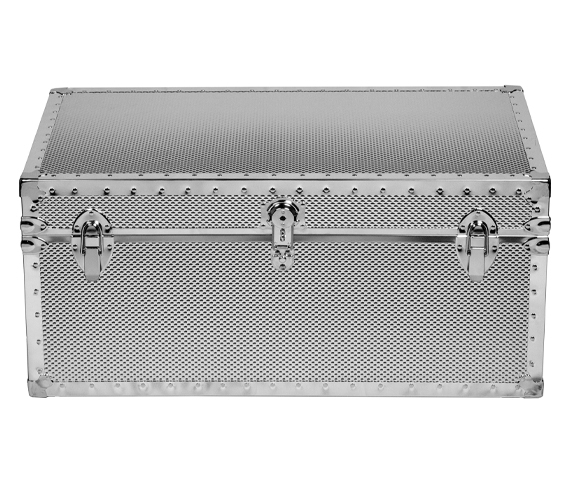 Add on an optional hardwood tray made with reinforced hardware for extra strength inside of our embossed steel storage trunk. 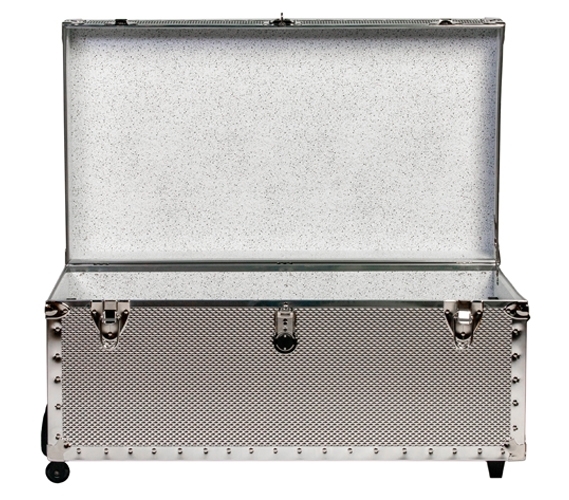 Our heavy duty embossed steel trunk also provides the option to add on wheels to this durable footlocker for convenience. The (2) 1.5” rubber wheels are reinforced with solid rivets for a quiet and smooth ride while two rubber feet keep your steel storage trunk from rolling away and can support up to 100 pounds. Or add on four commercial casters, each 3” tall, to your embossed steel storage trunk to comfortably support 300 pounds plus of storage! 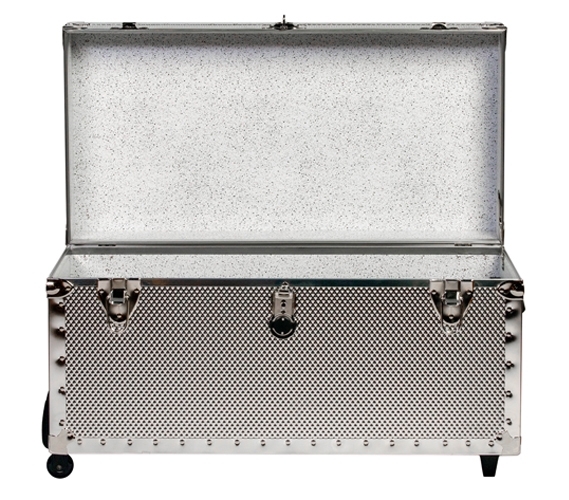 The sturdy handle on this dorm trunk makes it easy to comfortably handle and transport your steel embossed trunk. Keep your important college and home items protected and well-organized with our durable and long-lasting embossed steel trunk!